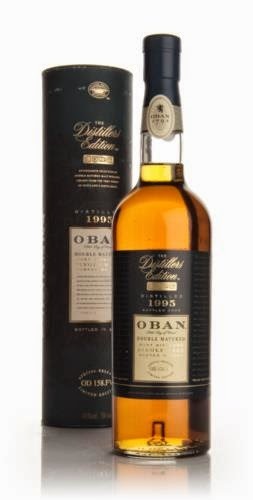 This Distillers Edition from Oban is double matured in Montillo Fino Sherry Wood. The smell is light yet creamy. Nutty sweetness with a hint of citrus. The taste is full of sherry notes, but not in the dark dried fruit style. It is still light and you get a note of toasted oak in the finish. The taste is great but the finish turns in to mouthwatering nothing very fast. It is a fine balance and a different style of sherry whisky than you normally get from PX and Olorosso casks. I will give this 87/100 (21/23/21/22).